The Anunnaki – Real Life Ancient Alien Gods? Are the Anunnaki a race of extra-terrestrials that first came to Earth 450,000 years ago, kick-started the human race as we know it, and essentially are the gods written about in ancient scripture and mythology all over the planet? It’s a crazy theory, no doubt. However, there is an abundance of evidence to suggest that at the very least, there is a possibility there might be some truth to it. Based on discoveries made in modern day Iraq throughout the nineteenth and twentieth centutries, the ancient Sumerians – thought by some until these discoveries to be mere myth – appear to have not only been influenced by the Anunnaki, but quite possibly owe their entire existence to them. In particular, the discovery of thousands upon thousands of clay tablets with cuneiform writing on them would provide the story of the Anunnaki, as well as tying them and indeed the ancient Sumerians to the much debated ancient astronaut theory. Before we get into the basics of those theories (which can fill entire volumes in itself), something else of interest to look at first. A video that keeps circulating around news feeds and media sites claims to show the preserved remains of one of these Anunnaki alien “gods” – a video said to have been “leaked” from inside Iran in 2008. It has since moved to Israel. While the video is almost certainly a hoax, the attention to detail is quite remarkable. You can view the video below and see what you think. The “readers digest” version of the ancient astronaut theory is essentially that aliens visited Earth in the very distant past, and genetically modified primitive man resulting in the human race as we know it today. They are also believed to be the “gods” in many major religions around the world. Erich Von Daniken’s 1968 book “Chariots Of The Gods” is largely regarded as being responsible for dragging the theory into the mainstream. Van Daniken sited numerous ancient megalithic ruins such as the Pyramids of Giza, the Nazca Lines and Stonehenge as being of extra-terrestrial origin or influence. The ancient astronaut theory also expresses serious doubts regarding evolution and the role it actually played in human beings’ development. Such theorists believe that aliens modified our DNA, possibly mixing in some of their own, which they believe explains the so-called missing link in our timeline. This is the reason we seemed to “evolve” from primitive to “thinking” man in relative terms, overnight. Furthermore, such stories as Adam and Eve and the Garden of Eden in The Bible, are to some, really speaking of these genetic experiments. The Garden of Eden is likely some kind of bio-dome where human beings’ development could be monitored. This would make “God” an alien – possibly nothing more than an extra-terrestrial scientist who monitored and instructed these early human beings. The opening line in The Bible would appear to suggest that indeed there might have been a team of such scientists who logged their experiments – “Let us make man in OUR image!” – very much plural, and what’s more it would suggest that these ancient aliens in fact looked very similar to how we do today. Check out the video below. It is the 1970s (and original) documentary of Chariots Of The Gods based on the aforementioned book by Erich Von Daniken. It offers a little further insight into the ancient astronaut theory, and although it is rather dated in its delivery, it is a good way of witnessing how this information was first presented to a more mainstream audience. In his book series The Earth Chronicles researcher and author, Zecharia Sitchin, took the claims a little further. Based on his own translation of a vast array of ancient Sumerian clay tablets, Sitchin unveiled the story of the Anunnaki in the first instalment of the eventual book series, “The 12th Planet”. Sitchin claimed that the Anunnaki were a team of aliens who were sent down to Earth almost half a million years ago, primarily to mine for gold. These initial expeditions took place in what is now modern South Africa. Ancient gold mines are present in this part of the world. What’s more, many Zulu tribes speak of how “visitors from the stars” came to Earth to mine for resources, in particular gold. As the years of mining went by, the Anunnaki soon began to feel the toll of the constant grind of extracting the gold from the “belly of the land!” So much so that they rebelled, and demanded that those in charge create a “worker race” to do the hard graft. Over thousands of years – such was the Anunnaki’s lifespan – Enlil “grew tired” of human beings. So much so that he planned to let them all perish in an upcoming flood – an event that would see the Anunnaki take to their space crafts and await the disaster to pass in orbit around the planet. According to the translations however, Enki had become fond of human beings – especially to the first “Adapa” who Enki had taken to educating with wisdom and knowledge. It was because of this that he instructed him to construct a “vessel” that would allow him and his family to wait out the flood and then begin life again. This is essentially the story of Noah and the Arc from The Bible. An exact replica of the essence of this tale is also told in The Book of Enoch. The short documentary below looks at Sitchin’s theories in a little more detail. Sitchin further claimed that the home planet of the Anunnaki is a tenth planet in our solar system, named Nibiru. According to Sitchin, Nibiru is a vast celestial body that orbits our sun in 3,600 year cycles. Cloaked in a cloud of oxide dust, when viewed from the ground gives Nibiru a winged appearance – something represented repeatedly in old Sumerian relics. Sitchin calculated that Nibiru’s last close passing of Earth was around 556BC, and also calculating that it would not be due to appear again until around the year 2900. Many groups and organisations have brought themselves into the public eye over the last three decades, claiming to know that Nibiru is soon to appear in our skies. Right up until his death in 2010, Sitchin went out of his way to distance himself from all of these groups, alleging them to be nothing more than charlatans. When the date passed and her prediction failed to come true, she went on to say that she was attempting to “fool the establishment!” to force them to play their hand. While NASA don’t discount the possibility that there may indeed be a tenth planet out of sight or undiscovered in our solar system, they flat out disregard the possibility that such a behemoth as Nibiru is out there. Particularly that it should pass so close to Earth that it would be visible in our skies. Despite that though, hundreds of videos appear online each year claiming to have caught the famed mysterious planet. Just one of which from January 2016 you can view below. Ancient Sumer – part of southern Mesopotamia, now modern day Iraq – is often referred to as the first civilization on Earth. They were essentially practicing many aspects of modern life – such things as, law, courts, education, medicine, science, agriculture, harvesting and purchasing of goods, marriage to name just a few 6000 years ago. As you might expect much of the artifacts and ancient texts that told us of their existence were held in the Baghdad Museum – until the early 2000s that is. In the wake of the invasion of Iraq in 2003, the museum in Baghdad where much of these ancient relics and clay tablets were stored was plundered and robbed of nearly all of its content. While some of the relics were undoubtedly taken by looters who would scavenge anything they could get their hands on, much of it seemed to have been whisked away by an organised “military” presence. The curators of the museum were responsible for some of these which were essentially salvage operations. Other relics however have since completely vanished – in particular clay tablets that held information dating back thousands and thousands of years. Some conspiracy theorists will tell you that this information has disappeared purposely and for a reason. Is it possible that these missing artifacts may have contained information regarding the origins of human beings on Earth? Many people have also noted how a lot of the old Mesopotamian relics and deities are almost identical to other ancient civilizations, despite having had no known contact with each other. Would this suggest that most, if not all creation stories and indeed the births of most religions trace back to one source, the Anunnaki? Check out the video below that features Zecharia Sitchin speaking about his theory. Very interesting viewing. Ancient Alien Links To The Great Sphinx Of Giza? UFOs, Aliens, And Contact Events In Ancient Writings? Might Saturn Really Not Be What We Think It Is? Did Messages From Beyond Offer Proof Of Ancient Alien Contact? 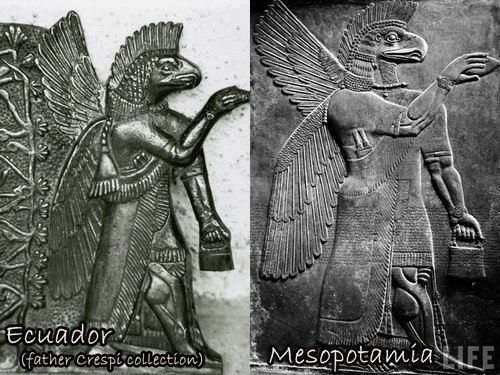 The Serpent Gods – A Connection Between Dinosaurs And Aliens? On the subject of Noah’s ark/great flood.The question comes to mind,how could the “ARK” accommodate 2 of each living specie on earth.Bearing in mind that a lot of species has become extinct since,there must have been quite a few that needed to be saved.Could it be that only the DNA was extracted,to be utilized in recreating species and forming hybrids at a later stage?